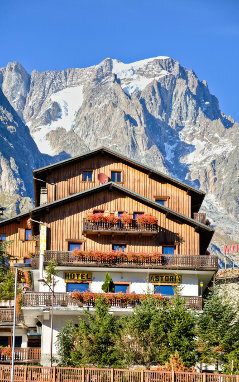 Opened in 1957, and since then managed by the family Berthod, the Hotel Astoria is located at the slopes of Mont Blanc, at the beginning of the Val Ferret, where in winter cross-country skiing enthusiasts and hikers with sealskins and snowshoes can immerse themselfs in nature and silence to enjoy the day in the open air; in summer turns, with beautiful colors, this small valley is an enchanted place suitable for adults and childrens. A beautiful 9-hole golf course at the slopes of the Grandes Jorasses, is an unforgettable destination for golf enthusiasts; the Dora di Ferret, which runs through the valley, there is a wonderful fishing reserve with brown trout, brook trout and rainbow trout, while the mountain refuges, which are the corollary, are easily accessible to all hikers, including childrens. Furthermore, there are bike rental, a fabulous well equipped playground, possibility of horse riding, restaurants and bars. Just 500 meters from the hotel there is the departure of the Mont Blanc cable car, which allows you to climb to an altitude of 3400mt. to enjoy a breathtaking view over the Western Alps, passing from the intermediate station located at 2175mt where there is one of four alpine botanical gardens in the Aosta Valley where you can admire rare and protected species of alpine flora. At 800 meters from the hotel there is the Val Veny cable car, one of the three cableway of the Courmayeur skirama. Just 4 kilometers from the hotel there is the center of Courmayeur, whose famous shopping street, the Via Roma, awaits you with designer shops, restaurants and places to spend unforgettable moments.